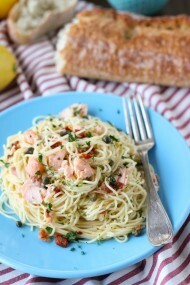 This is one of my favorite ways to prepare salmon. It takes less than 5 minutes to prep and then you put it in the oven and let it do the job. In 10-15 minutes, dinner is served. Simple, but divinely delicious. The fish is flaky, moist and so good for you. 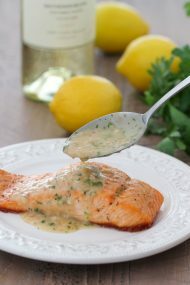 With a squeeze of lemon juice, you have yourself a healthy and amazing dinner, which looks stunning too. Preheat the oven to broil. Line a deep baking dish with aluminum foil. 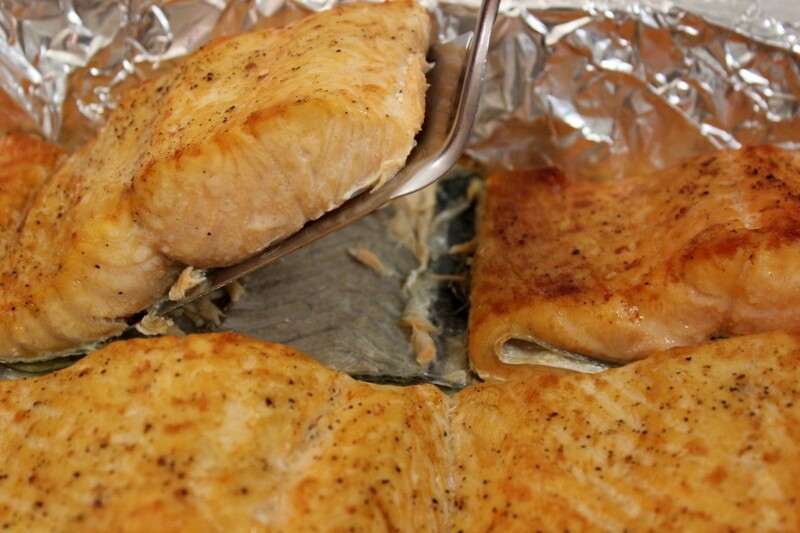 Place the fish on top of the foil, skin side down. Rub olive oil over the surface of the fish. Season with salt and pepper. 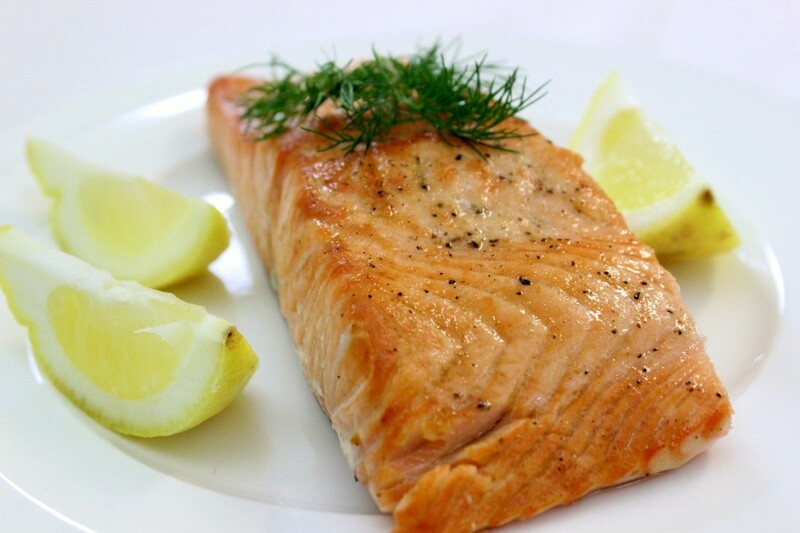 Salmon is a thick fish, so season well – don’t be shy with the salt. Broil until golden brown, 10-15 minutes. You can check the fish for doneness with a fork. If it flakes easily, the fish is ready. Slide a thin metal spatula between the fish and the skin. It will come off in one piece beautifully. This part always makes me want to smile and break out into a song. 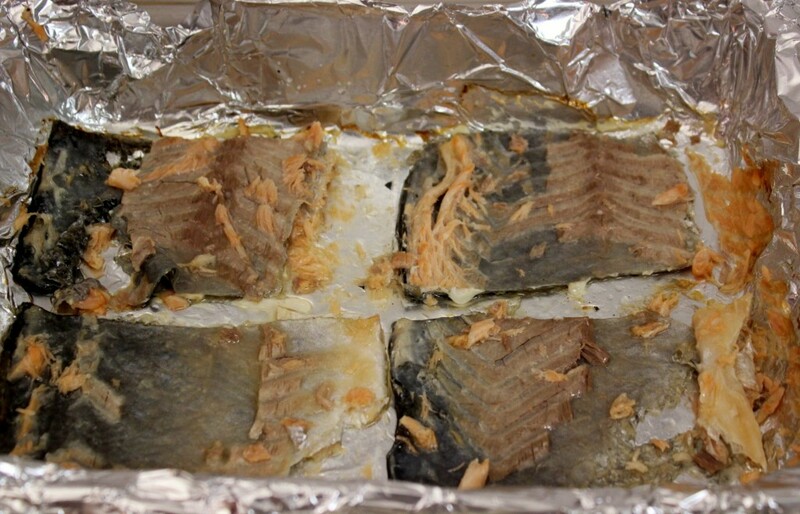 Isn’t this the easiest way that you ever saw to skin salmon? PLUS, no cleanup necessary! There are so many directions you can go from here by adding different sauces, glazes or even breadcrumbs. I’ll be sure to post my favorites with you soon. 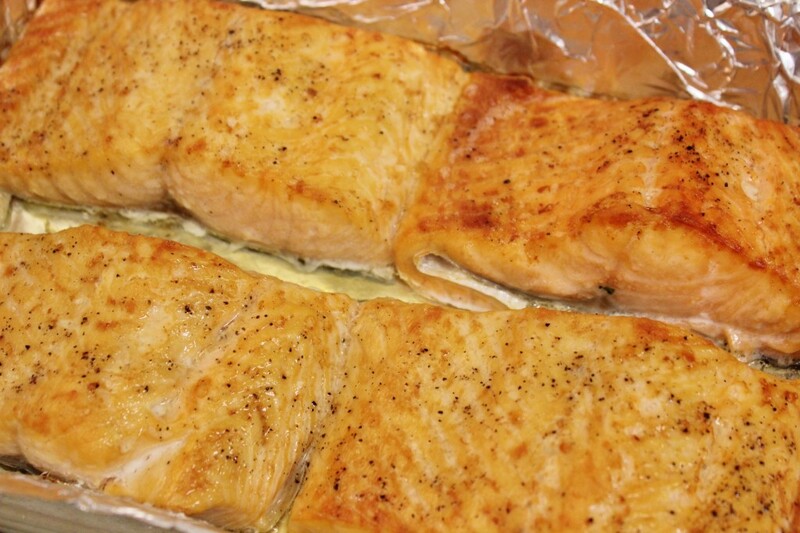 Place the fish on top of the foil, skin side down. Rub olive oil over the surface of the fish. Season with salt and pepper. 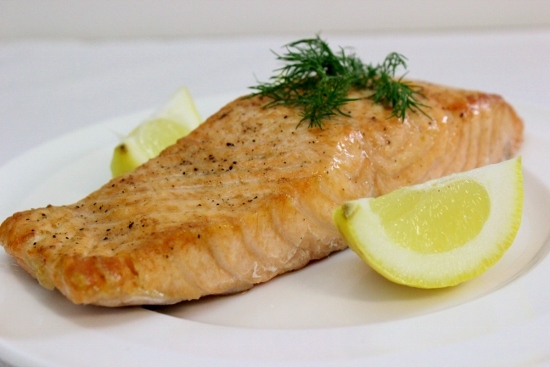 Salmon is a thick fish, so season well – don’t be shy with the salt. Broil until golden brown, 10-15 minutes. You can check the fish for doneness with a fork. If it flakes easily, the fish is ready. Slide a thin metal spatula between the fish and the skin. It will come off in one piece. Made this salmon the other night.. So easy and delishiou! Thank you Olga! Great recipe!!!! So easy to make and soooo delicious!!!! !Thank you Olga!!! I got so many compliments for this dish!!!!! I make my salmon a little different. 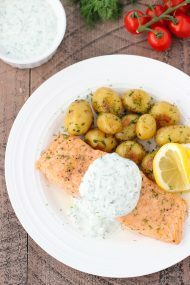 In a bowl mix a few Tablespoons of mayo and ranch, spread it over the fish and season with some paprika, garlic powder, and lemon pepper. Then put some fresh dill and a couple slices of butter on top. Bake at 350 for 16 minutes. Yum!! That sounds really yummy, Inna. I bet the fish is really juicy and that topping sounds so creamy. I use dill with salmon too. This is brilliant! So easy and delicious! Olga, thank you for sharing your yummy recipes! This is so easy but tastes DELICIOUS!!! I loved every bite of it. 🙂 Thanks for posting! I’m so happy to hear that you liked it. It’s one of my favorites! Much for such wonderful and delicious recipes!! I’m not sure what exactly you are asking. Could you clarify? 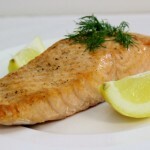 Salmon is very versatile, so many side dishes would go well with it. Check out the Side Dishes that I have posted. I love serving Salmon with Rice or Couscous. Some of my favorite salads and veggies – green beans, Cauliflower Tomato Salad, Crunchy Cabbage Cucumber Salad. That is so sweet of you to say, Anna. Thank you so much for being such a loyal reader.